This transformation shows an arrow being translated 4.5 units to the right and 1 unit down. This translation can also be shown as (x=4.5, y=-1). Translations are made through using vectors. A vector is a quantity that has both direction and magnitude. Basically, it is a line with a certain vertical and horizontal distance. The length of the vector tells the horizontal distance that the object will travel. The change in height from the start of the vector to the end will tell the change in height of an object. The starting point or initial point of the vector is all of the points of the pre-image. The ending point or terminal point of the vector is the points of the new image. There will be a vector for each pre-image's point connecting it to its corresponding point on the image. 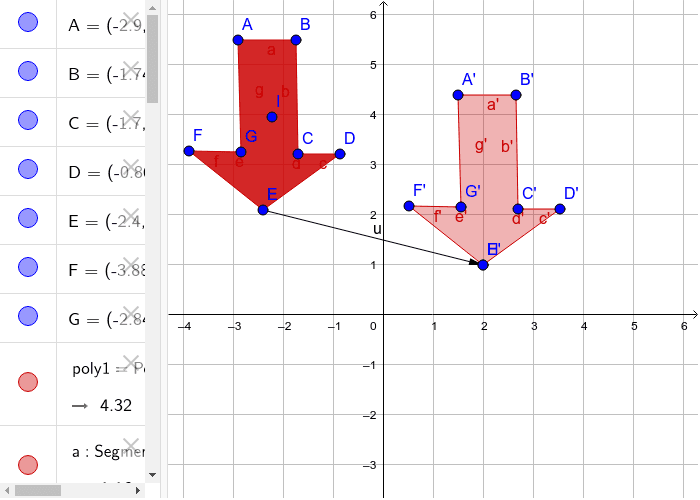 Each vector will be the exact same in distance and change in height for each point. The vector can be set for anywhere. If your want your image to move left, then your vector will point left. If you want your image to go down, then your vector will have a slope based on how far down you want it to go. Using vectors, any object can be translated.